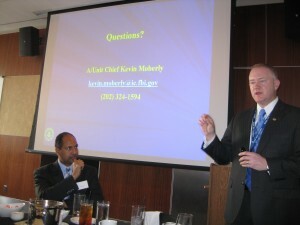 WASHINGTON — In the most appropriate of places — the International Spy Museum in Washington — FBI Supervisory Special Agent Kevin Moberly of the Economic Espionage Unit on Tuesday addressed a group of business people about the theft of corporate secrets. “Who’s the target…? Pretty much everybody,” he told the group at a luncheon organized by the American Society of Industrial Security — National Capital Chapter and sponsored by NOVA Technical Services, a Virgina-based company that specializes in technical surveillance countermeasures. Moberly said every aspect of corporate secrets seems to be fair game, from aerospace to biological and agricultural secrets, and the thieves can be competitors or foreign nations. He told the business crowd what to be on the look out for with questionable employees: Frequent international travel; changes in behavior; an unexpected resignation and downloading data prior to leaving the company. During the presentation, he noted that a Russian KGB agent in the 1980s said his nation only needed the defection of three American generals to win the cold war: General Motors, General Electric and General Dynamics. He detailed the case against Dongfan “Greg” Chung, a Boeing stress analyst, who was busted for leaking highly classified information to the Chinese government for decades. Agents found about 300,000 pages of trade secret-proprietary papers in his Southern California home on the U.S. space shuttle, a booster rocket and military troop transports. He was sentenced to 15 years and 8 months in prison in 2010. Moberly also warned that business people traveling abroad need to be careful about securing top secret materials in places like hotel rooms. He showed a video of Chinese agents entering a hotel room with the help of the hotel employees, and going through an American businessman’s belongings in an apparent search of secrets. At some point, he said, they discovered a hidden camera, which was installed by the American company, and wondered whose camera it was. Posted: 2/8/11 at 4:28 PM under FBI, News Story.